One of my new favorite shows is K9 Cops on the Animal Planet television channel. I love watching Police dogs in action. So much of what these dogs do is truly amazing to me but at the same time they’re also just being dogs. When these dogs take down a bad guy, they’re getting thumbs-up and atta-boys from my place in front of the tv. The St. Paul Police Department has twenty one K9’s which is really an impressive number. I haven’t studied the numbers but that’s the most dogs I’ve ever heard of on one department. There may be other departments with larger K9 units. From what I can tell, the dogs and their handlers are extremely well trained. St. Paul spends a lot of money on K9 training which in my opinion is without a doubt money well spent. If you’re going to have K9’s on your department it’s imperative that both the dog and the handler be exceptional at their jobs. Not only can ineffective dogs and handlers be an unsafe part of a department but if not done right, cases can get thrown out the window on a technicality faster than you can blink an eye when it comes to prosecuting the bad guys. As much as I love watching this show, there are some safety issues that really bother me. In fact, I’ve been so bugged by it that several weeks ago I actually emailed the Chief of Police off of their web site. I haven’t received a reply but then I really wasn’t expecting one. I just wanted to get my point across to him and hope that he will take some positive steps to get the St. Paul K9’s better protected. The show majorly stresses Officer safety. It’s an intrigal part of the show’s theme and is talked about several times throughout each episode. I like this, it’s a good thing. However, the safety issue seems to revolve around the Officers and pretty much totally ignores the dogs! I have no qualms about keeping Police Officers as safe as possible and since the use of K9’s is helpful to accomplish this – it too, is a good thing. A smart cop wears a bullet-proof vest. Wearing a vest is not a 100% guarantee of survival but it sure has a much higher potential of stopping a bullet before it injures or kills than not wearing one. I like the survival odds much better for a cop wearing a vest than one who doesn’t. The K9 is considered to be an Officer but I have yet to see a K9 on this show wearing a vest. I hear repeatedly in the show how the handlers feel their dog is their partner, their protector and they say this works both ways. They talk about their own and their family’s love for these dogs. But do they show it by providing for their safety? I don’t see it. Just the other night one of the higher ranking Officers commented that the dogs are often first to go in to a dangerous situation and how that helps keep their Officers safe. These dogs are going in without vests. What protects them from taking a bullet or a knife in the chest? Where is the respect for their lives and the love for the dogs? In tonight’s episode, there was a segment on the St. Paul K9 Cemetery where there are several Police dogs buried, killed in the line of duty. The Officer mentioned how emotionally painful it is to lose your K9 partner, but then went right on to say in a very casual tone that it’s worse to lose a human Officer. Well, maybe for some people, but to me there wouldn’t be much difference. A partner is a partner whether it walks on two legs or four. How many of these dogs would be alive today had they been wearing a vest while performing their duties? How many Police dogs have to die in the name of protecting human life before our Police Departments wise up and protect them in the same way they protect their human Officers? Not vesting an active member of a Police Department is wrong! As much as I love watching these dogs in action, Police Departments who treat such important members of their organizations without apparently caring one iota for their safety are really starting to make me angry. These dogs gave their lives to save a human. They took the bullet or the knife or whatever, intended for their two-legged partner or lost their lives attempting to take a bad guy into custody. This person may have just severely injured or killed another human being that could be your spouse, your child, your Mother or Brother. This dog may have just prevented your child from picking up a dumped bag of illegal drugs that could kill him or her. There are endless possibilities as to what this dog was doing when he died to help us all. We as a society, should all be forever grateful and show our appreciation by seeing to it that we do whatever it takes to insure that other K9’s don’t suffer the same consequences. Is it that bullet proof vests for dogs are expensive? If that’s the reason, it’s a lousy excuse in my opinion. The cost of a K9 vest doesn’t come close to the cost or replacing a dog and the loss of a dog can be devastating. I can say without a doubt, that if I were a K9 handler and my department did not provide a vest for my dog, I’d be paying for it out of my own pocket. I can not think of one single acceptable reason for these dogs to be vest-less. One amazing young lady in California felt the need was so great to vest our K9’s that in 1999 she started the Vest-a-Dog Foundation. Stephanie Taylor was just 11 years old when she began her quest to help keep our K9’s safe and last I heard, Vest-a-Dog has contributed to vesting more than a thousand K9’s. Stephanie, you are an amazing young lady! If an 11 year old child can see the need, why don’t Law Enforcement agencies who don’t vest their dogs see it? Have you seen how these dogs pull when they’re tracking? Sometimes you can hear the dogs breathing, or should I say choking? How would you like to go jogging or running wearing a neck collar with someone holding on tight to the other end of the leash holding you back? Just for the heck of it, spread your hand, put your first finger and thumb around the front your neck, lean your neck forward and push into your neck with your hand. Now imagine tracking down a bad guy like that. It’s even worse for the dog because they don’t realize they may hurting themselves. 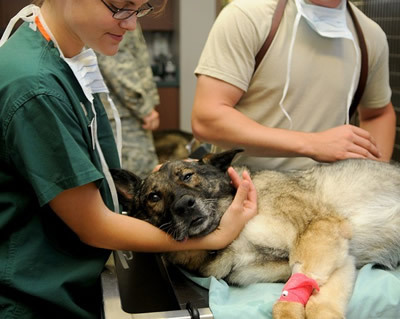 Dogs handle pain differently than humans, it’s part of their inherited survival mechanism. They’ll continue to work after being hit by a car, after being shot or stabbed, you name it. If they can get up, they’re going to keep going. They’re going to continue to serve and protect for as long as their bodies will let them and by the time their bodies put a stop to the action it may be to late. Harnesses are made for pulling, they are designed not only to allow the dog to pull without pain or physical harm, but harnesses encourage pulling. Do you see Alaskan sled dogs wearing neck collars? No! They are harnessed not only for their protection but because the harness helps them to do their job more efficiently. I tend to think a harnessed K9 would be even more effective than one being choked by a neck collar. He’ll also live longer and won’t require expensive vet bills to attempt to fix the damage done by a neck collar. With all the training these K9 units get, why haven’t they learned that a neck collar is not what should be used? The potential for permanent pain and damage to the dogs throats is sky high! I have seen just one of the St. Paul Officers switch their dog over to a harness when they’re going to be tracking. Being that these dogs are very high energy anyway and always ready to do their job, why not just do away with neck collars altogether and use harnesses instead? Where is the K9 RECOGNITION? This may change by the time you read this, but I just checked the St. Paul Minnesota Police Department web site. The dogs and handlers who work so hard to serve and protect the citizens and Officers of St. Paul, the same department members who now have a successful show on national television, don’t have one single page on their own department’s web site. They have a page honoring their fallen human officers, but nothing honoring the K9’s that have died in the line of duty. They have a links page where you can find links to their K9 Foundation, but these links take you off the official site onto other sites. Where’s the love and respect for these courageous fellow department members?. Why does it cost so much ,for equipment ? There has to be some kind of funding for this purpose.These dogs are not replaceable.They are much more important then people realize. How can a non-profit organization be started?The materials are needed, but 20,000 is outrageous for this purpose.These dogs deserve the best. I totally agree the cost is outrageous and I’m sorry I really don’t have an answer for why the cost is so high. Sometimes I think the manufacturers take advantage of the love people have for working K9’s and/or the need for their services being so popular but I truly don’t have a clue as to the real reason. There are numerous organizations across the country that raise money and provide things like vests and other equipment. Sometimes the local communities raise money as well and donate needs for their own K9’s. I’m right there with you, these dogs deserve the absolute best equipment and care that anyone and everyone can provide for them! But of course there’s always a need for more people willing to devote their time to fundraising so if you decide to move in that direction yourself I wish you all the best and much success with your efforts! I guess a better way to sum up my position is that a dog deployed to locate bad people needs every bit of speed, agility and endurance that he or she possesses to be safe. Current ballistic offerings for dogs cost more than human vests, and protect less, and compromise speed, agility and endurance. Far more dogs suffer heat related injuries than bullet wounds, and I would prefer to gear their protection to the threats they face. Sending a canine in after a known, barricaded, armed violent felon, armor him up with ANY of the currently available armor. In that situation the worst armor is better than no armor, and it is a short term static deployment where the dog would have plenty of down time and supervision to stay hydrated and cool without the situation providing a detrimental distraction. Day to day deployments, such as tracks, searches, apprehensions, despite the possibility the that many of them are armed, would find the armor riding in the car, trading protection for effectiveness. In a fight with a man the dog stands a better chance of dominating the man if the dog is not encumbered. I know of two armor projects going on that are lightening armor and greatly reducing blunt force trauma. I look forward to testing these systems in the next couple of years to see if they live up to their hype. If they do, I will be buying a lot of it for my cops. But the technology is way new, not well understood, and not designed for ballistic protection, but rather being adapted to it. This may be a solution and a decade or so to shake out the details may provide workable canine armor. I just came across this blog post, and hate to re-activate it, but I wanted to add something to the discussion. I have worked with canine teams from four different agencies, including two with pretty insane budgets, who can afford any needed equipment for their units. I also have access locally to a world class canine trainer and the department he oversees. None of them use vests on their dogs. Many would consider vests for very specific jobs, but do not want to be required to use them. Canine vests are not where they need to be, yet, and can be a huge waste of money. The idea is sound, but the execution tends to be very flawed. They tend to be designed by armor designers looking for a market, rather than trainers, handlers, and vets of working dogs. The marketing relies on much of the reasoning posted here, rather than on the needs and uses of a working dog. The vests cost money that could otherwise be put to use. I know of several agencies offered free vests that turned them down, not wanting the money to go to waste. They would have rather the vests be donated to agencies that wish to use them. 1) The vests can be bulky and cumbersome. They restrict the dog’s agility in tight places, which can be a serious tactical issue preventing the use of the dogs in the very arenas they are most suited for. They also retain a significant amount of heat, not an inconsequential point in my locale, which is the desert southwest. Heat injuries to dogs kill more of them than bullets do. Do a google search on military canines Iraq, and you will see that many wear harnesses, the photos that I have found in the last 10 minutes or so only shows dogs in armor that come from the armor manufacturers. The bulk and weight also negatively effect “nose time”. A searching canine is focusing intently on scents, and usually can only work for 20-30 minutes before needing a break, as the process is exhausting to them. After a short break they can go back to work. Even if you have a super conditioning program that gets you twice that amount of on a search, the vests tend to have a negative effect on search time. To my knowledge there is no scientific evidence pointing to this, only anecdotal evidence from handlers and trainers that I trust with my life. 2) According to one veterinary study, which I don’t have handy right now, 60% of police canine injuries are to the head and neck. I know of three dogs shot in the line of duty locally, and they would not have been helped by a vest. If you read the fine print on body armor for people, the armor does not have to stop rated rounds within three inches of the edge of the armor panel. So take a panel of armor to fit a given dog, and the rated protection starts about three inches in from each edge. That leaves precious little coverage for the dog’s vital organs. My current body armor meets NIJ standards, by doubling the thickness in my sternum area. While human body armor has to meet NIJ standards to be certified, there is no standard for canine vests. A manufacturer can claim anything they want, and frequently do. Body armor is also tested at 90 degrees, so rounds may penetrate or slide along armor to its perimeter and then enter the dog’s body when encountering it from an angle. A working dog coming at someone is not likely to present a 90 degree shot to a suspect, rather the biggest targets are the head, neck and chest. Several vets I know have expressed concern that a dog would survive the blunt force trauma/back face deformation of a gunshot to a canine vest. Again there are human standards in place, and none for dogs. Differences in skeletal shape between humans and canines make the vets say this. There have been no studies I am aware of on back face deformation and blunt trauma for dogs as a result of non-penetrating gunshot wounds to an armored dog. Back face deformation and blunt trauma are significant sources of injury to humans. Of the dogs I know of that were shot, two survived. They tend to be a little tougher than people in that regard, and one of them is still recuperating. Please don’t misunderstand me. I am not hauling up this necro-post and weighing in because I want to rain on your parade, or because I am not invested in canine unit protection and safety. It is quite the opposite. I am hoping to close out my career as a canine handler. I am commenting with my 15 years of experience as a police officer in two large metropolitan areas, much of which was spent hanging out and helping with canine unit training, as well as deploying with them to search for very bad people. I have discussed these issues with handlers, trainers and vets of varying levels of experience and service. I have cried with handlers when their dogs were put down, two due to cancer, and three to old age. I have the utmost respect for the animals and what they are trained to do. I trust the handlers, dogs, and trainers with my life every time we deploy, and I because I trust them, I trust their opinions when they share them on this issue. I have been a police officer with one large municipal agency and one state agency, and both agencies did not want to see money put to equipment they did not think was useful, when there was so much that was needed and not funded. I do hope that with the upsurge in canine use since 9/11/2001 that armor is being developed that is a better solution, but so far the issues described have not been fully resolved to the end user’s satisfaction. We need to remember that the needs of the dog, the canine team, and the department should determine what gear is available and used. Given the costs of a canine unit overall, a canine vest is a very small investment, but one of dubious value. When a vest comes out that solves the problems with current vests, I will be the first in line to buy one. I’m really glad you decided to join in this discussion. You put a lot of thought into what you wrote and I don’t feel that you’ve rained on my parade one bit. I really appreciate the huge wealth of knowledge and experience you’ve shared with us, thank you. There’s no doubt that manufacturers can say anything they want about any product and it’s quite often up to the consumer to do their own research for their specific needs. Unfortunately, in too many cases the consumer winds up being the product guinea pig. The fact that there’s no standards in place and that these manufacturers don’t rely on or at the very least consult extensively with the expertise of the handlers is not only sad but very wrong. Some of the points you’ve made are also applicable to humans, such as the dog’s shape as compared to a human is quite different and poses problems for dog vest construction. On the other hand, there are handlers of all sizes and shapes and there are standards in place for human vests but none for dogs. There’s something very wrong with this and I feel it comes from the fact that there’s still way to many people with the heartless mentality that “a dog is just a dog” and/or “a dog is just a tool.” To hear the heartless brass of the St. Paul Police Department (I’m sure they’re not alone) speak with total disregard for their dog’s safety on probably every show was sickening and literally trashed my joy of watching these beautiful dogs in action. Since you know so much about the needs of making K9 vests that work better than what’s available now, perhaps you’d consider helping to get things like vest standards in place and finding solutions to the existing problems with the vests so that these dogs who deserve so much more than being sent in to die without any kind of protection can be protected. The vest makers need people like you to make this happen, but more than that … the dogs do. Again, thanks so much for all your time and info. Where are the bullet proof vests for your dogs!!!!!!!! I am shocked. The TV show states how you stress safety but the dogs go in with NO protection. Shame on this department. You even have the St Paul K9 Foundation which raises money. WHY NOT for bullet proof vests?? You’re absolutely right and I totally agree. It should be a requirement if your department has a K9 that you *must* provide and *use* a bullet proof vest on the dogs at all times the dog is working. I’ve seen the episode where they show the Officer sweeping up their K9 cemetery and every time I see this show I get angry all over again. Unless they died from an illness or old age, every dog in that cemetery would probably have lived to continue to work until retirement. I love the hole idea of this page, I myself am a dog lover and own 2 german shepard siberian huskey mixes. I just couldn’t get over the fact that on this show they were useing neck collars! It blows my mind that they are so smart but they neglect to see the smaller picture of comfort for the dogs. Thank you for your comments, Melissa! I agree, but in my opinion it’s not just the dog’s comfort it’s their safety that’s being ignored. K9s’s are super high energy and it takes a lot to hang on to them in a working situation, which you can see in every episode. You can see how they strain in the collars which is pushing or crushing into their trachea areas. The dogs will ignore any pain from this but I would bet you if necropsies were performed on deceased K9’s that they would find evidence of damage from the collar use. I wish they would necropsy them just to gather data on what this job does to the dogs. Maybe then more police agencies would get serious about vests and that maybe someone would come up with a collar that’s more safe for the dogs. Now that K9 Cops is back on the air here (yesssss!) and I’m seeing episodes I didn’t get to see before, I see much more use of harnesses for when the dogs are tracking than I ever saw in the earlier episodes. Yayyyy! Hi Becki, thanks for your comments! I think fund raisers for K9 vests is a great idea and I’m sure there are many departments that do this. If a department is looking into getting a K9, before they get th edog we think they should have enough money in the K9 budget for safety equipment for the dog or don’t get the dog until they do. If they already have K9’s they should find a way to find the money to vest them and it should be a priority. K9 Cops is back on the air here (yayyy!) and I’m now able to see episodes that I never saw before. It makes me very sad that after all this time the St. Paul K9 unit sill doesn’t vest their dogs — at least I haven’t seen one single vest on a St. Paul K9 and I watch the show almost daily. I absolutely LOVE watching these dogs work but to hear the ranking officers that talk on the show stress how the dogs go in first and are safety measures for the human officers without giving the dogs vests is very hard for me to listen to. To me its contradictory to give your human officers safety equipment and talk about how the dogs protect the officers but no safety vests for the dogs especially since the dogs go in first??? Just makes no sense to me at all. How do you justify protecting just part of your department? I don’t get it. Just a couple of days ago there was an episode where an officer got dressed into what appeared to be full SWAT gear including a helmet and the biggest baddest vest I’ve ever seen a cop wear. There was the dog wearing nothing but a leash and collar. I agree about the vests. I like this show so much and I wish the dogs had vests, I used to live in Minnesota and there was always jars at gas stations you could donate to buy K-9’s vests- i lived out in the western suburbs but,maybe we if a fund raiser or a place to donate online people could raise money to buy them vests. I think they should all have them! For the dog’s safety and beacause they are also protecting the police officer’s life. Thank you so much for sharing this, Diane. My heart goes out to each and every K9 who’s been taken down (or even just injured) due to the neglect of the agency who doesn’t do whatever they can to protect ALL their own – not just the humans Officers. If your department cannot afford or for any reason does not provide your K9 with protection – you have no business having a K9. You’d not send your human officers out without a bullet proof vest and/or other protection gear – why do you send your K9’s out without it? I totally agree with officers protecting their K-9’s. These dogs were trained to run after criminals, but the dogs didn’t know they could get killed doing this. We just had a situation happen in Palm Springs,CA and they call the dog an officer. If he was an officer, he should have been wearing a bullet proof harness. The cop was wearing one and was saved and the dog died. This dog did not have any idea he was going to be killed. What the heck did the cops things would happen…a felon running from them and they send the dog to bring him down….isn’t it obvious a gun would be pulled on the dog. 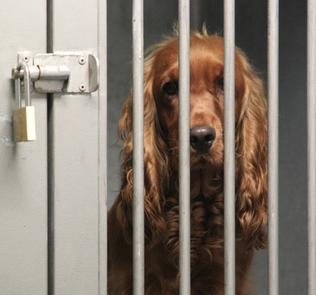 It is so inhumane that these dogs are not protected. I believe it is a form of animal cruelty…and so life goes on. The Palm Springs City Council tonight will hold a tribute to the police dog who was killed by a wanted parolee. Known as “Ike,” the dog was shot early Sunday when released to chase down a suspect Palm Springs police were trying to bring in. Francisco Gabriel Durazo, 31, shot the dog and injured an officer before being shot and killed by a second officer. “It was the opinion of everyone who knew Ike that he was the ultimate friend, an outstanding partner, a loyal member of his handler’s family and, in the end, a lifesaver,” said Al Franz, interim police chief of the Palm Springs Police Department. A fundraiser called “Run for Ike” has also been announced. Planned by the Palm Springs Marathon Runners team at the Ramon Alternative Center, the May 7 event will try to raise the $6,000 required for the purchase of another canine, Palm Springs Unified School District spokeswoman Joan Boiko said. I think being a k-9 cop is a cool job, i am going to follow my dream into becoming one as a policewoman, i would like to fight crime and stop bad guys from breaking the law. I want to be a good cop, and give people a ticket for speeding, or arrest them for getting into an accident. Hi Monty – are you referring to choke collars or pinch/prong collars or are the findings on all three kinds? Got any links you can post here so folks can see these results? Unfortunately, TV program line-up schedulers in their infinite wisdom chose to remove K-9 Cops from our TV line up here, so I’ve not seen the show in months. The Animal Planet web site has episode information from October and it doesn’t look like anything else has regarding the show has been updated either. I had no idea there have been K-9 fatalities. I was able to track down info that Cobra died unexpectedly a few weeks ago with no explanation as to the circumstances and that Ranger passed of brain cancer. Very sad news, but at least they were not murdered by lack of a vest. I haven’t found any info on Morgan’s passing but did find out that Boomer was shot and is recovering, YAYYY! I don’t know if Boomer was wearing a vest or not. Does anyone know? Do not get me started on choke collars! THEY SHOULD BE OUTLAWED. Autopsies in Germany have found very serious muscle and nerve damage. I love K9 Cops on Animal Planet. My GSD Sarge and I watch it all the time (love the DVR) Disturbed by the fact that they use choke collars. Put one on your thigh and give it a good tug. You’ll question this practice also. I was deeply saddened to here the news of K9 Ranger & K9 Cobra, Forever may their memories last. Hi Jessica, thanks for stopping back and providing more info on your feelings. I do appreciate it very much and I feel you have a good point. I didn’t see it as being negative, but your additional comments put things in another light. I will do my best to make this a more positive thing from now on. I would also like to say that we’re very sorry for the loss of your dog. We’ve lost several of our own over the years, and know all to well how devastating this is. You have all of our condolences. To anyone else who’s been offended by my comments, you have my apologies. I had no intention of offending anyone, only to help bring awareness to the K9 safety issue. Thank you, Jessica for bringing this to my attention. having lost a dog i wouldn’t want my worst enemy to have to go through that. i absolutely believe in k9 and officer safety. however, your comments are black and white no gray area, if a officer doesn’t vest a dog or use a harness he or she doesn’t love and care about their dogs. that is what i dont agree with and take offense to not the fact that dogs and handlers need to be safe. i happen to disagree with you about your last sentence. when you are trying to get people to hear your cause and get on your side it is absolutely how you say it. many great causes are sometimes not given enough attention because of the negativity shown by the people that are just trying to make a difference but go about it the wrong way. i did not write to start a fight. i believe in your base cause that officers and k9 need all the protection that they can get. i just think that maybe you shouldn’t say officers dont love their dogs enough or whatever little word you put at the end to justify what your saying. Hi Jessica – It’s nice to have another GSD lover/handler/rescue person jump in here! I commend and thank you and your hubby for your work and dedication to the dogs you work with! It is so great to see the St. Paul dogs and handlers in action! This show is as up front and personal as most people will ever get to seeing these magnificent animals and their handlers in action. I said I love the show and I do think the Officers and their K9 partners do a GREAT job! However, their work is not the issue nor in question here. I’m sorry you don’t agree that all K9’s deserve to be protected as best we can protect them, which in our opinion, includes bullet proof vests and harnesses instead of collars. It’s not that the handlers and departments don’t care, period. If they didn’t care, they probably would not be a K9 handler. We feel that cities with K9s should care enough to provide safety equipment. After all, these dogs are keeping their human Officers safe while helping to protect the public. We never know when we ourselves are going to need the services of a Police Officer and maybe their K9! One thing stressed throughout the show is safety but it seems very one sided, geared towards human Officer safety. Human Police Officers should have every bit of equipment it takes to keep them safe. Our issue lies with the question “Where is the safety for the dogs?” A dog going into a dangerous situation without protective equipment is like sending in a human cop without his gun and vest. We would never expect this of a human cop. K9 safety equipment could be a part of the Department’s uniform allowance package for one suggestion. If the cities and Departments don’t, then we think it’s up to the Officers to see to it that their dog is outfitted for safety. If some Officers can’t afford to do this (and I’m sure there are those who can’t – times are tough, I understand this), and their cities won’t foot the bill, then they can do fundraisers, take donations or contact Vest A Dog. There’s also a link on their home page for starting a local vesting program. Nobody likes to see higher taxes, but if my city wanted to raise my taxes in order to cover the cost of safety equipment for K9s, I’d not complain one bit and in fact would donate even more money than required. I don’t have school aged children, yet some of my tax dollars goes to the school system. That to me isn’t right, school taxes should belong to those who have children in school. Tax dollars going to help protect these dogs which in turn helps protect every citizen is absolutely ok by us. A number of years ago, I had a group of cops take down a bad guy in my own driveway they’d been chasing. Had my Officers not been in pursuit, this jerk could have wound up in my house and he had a gun! If it can happen to me, it can happen to anyone. If you think about it, it would probably only mean increasing each individual tax payer’s tax responsibility by a few dollars and not even be discernible on one’s tax bill. In a city the size of Chicago for example, it would maybe only be a dollar per tax payer (if that!) because it’s a high population area. Smaller areas have fewer K9s, and the tax same scenario. We feel the handlers need to care enough to see to it their dog is protected, whatever it takes. There are ways to make this happen without taking away from their own income. These dogs help bring them home safely to their families every day. Their wives still have a husband and their children, a Father. Cops and their human partners have a unique bond as well, and they do what they have to in order to keep one another safe. If their human partner didn’t have a vest for example, don’t you think the one with the vest would help see to it the one without got one? I’m glad you mentioned the bond between cops and their K9 partners. There is no other bond like it I’m sure! K9’s have no idea the importance of the service they perform and more importantly the danger they are in, but we humans do understand. So, why then are the two bonds thought of or treated differently? K9’s cannot outfit themselves for safety, that’s the human’s job. I’m sorry you were offended by my comments. Offense wasn’t intended towards you or the SPPD K9 Officers and Department or any other K9 handler for that matter. K9s and their handlers have our respect, gratitude and a tremendous love for their dogs. A K9 unit is a very unique and important service to the public. Both handlers and dogs put in tremendous amounts of hours, work and dedication to be good at what they do. They are the elite! I think my reply to Candy’s comments covers that. We feel it’s of the utmost importance to bring about an awareness for this issue. K9’s are very special. They have a tremendous and very dangerous job to do! They deserve to be protected not simply be replaced because they die needlessly in the line of duty. Don’t you think that if the K9 was able to comprehend the danger they’re in and if they could speak, they’d ask “Hey, where’s my vest?” Granted, the cost of a vest and a good, suitable harness may not be cheap, but it’s considerably less costly and less heartbreaking than replacing a good dog? Once that bond is developed, it carries over to the dog having become a member of the handler’s family and the department it works for. You probably have seen in the show that the loss of a K9 directly and sadly affects the children in that family. By vesting the dogs, the handler is also helping to protect his family from having to feel that heartbreak. It’s hard enough to lose a dog to illness or age, which is something that can’t be helped. But we can do something about K9 safety. By outfitting them for safety, departments would actually be saving money and at the same time, keeping their dogs as safe as possible. It’s a win-win situation. As K9’s are retired, the equipment can be passed on to the incoming dog, so dog safety equipment in good condition is recyclable as well. We see to it that our human cops are kept as safe as we can by providing them through our tax dollars with proper equipment. For us, there just simply is no excuse for these dogs to not be kept as safe as possible as well. They are cops doing a job that a human cop physically can’t do because human noses aren’t as refined as a dog’s nor is sometimes their presence as effective as a K9. The show itself pointed out that a bad guy will surrender to a dog more readily than to a human cop. Now that is impressive! These dogs are protectors of the public and some have even achieved hero status. We’d like to see more of them achieve hero status without dying in the process. Having a K9 handler for a husband and being involved as you are with dogs, I’m having a hard time understanding why you would disagree on providing safety equipment for them. Whether you’re offended by my comments or not, the issue is K9 safety, not how I say something. i first all would like to comment on candys comment about dog handlers hating their dogs. ARE YOU INSANE????? my husband was a k9 handler for years until he (the dog) passed away. k9 handlers and their dogs have the most special of bonds and your comments are completely out of line and cruel. we still have 3 gsds and i have been involved with gsd rescue for years and when i watch this show i am totally impressed with the dogs and their handlers. rileys mom, while i admire your enthusiasm, i also think that some of your comments are out of line as well. quite honestly i cant even get on your side about any of your issues (one reason would be that i dont agree) because of your negative comments about handlers not caring for their dogs. since this is your page you can say what you want just thought you should know that someone has taken great offense to your comments. to the sppd k9 unit: you guys are all great handlers and have amazing dogs. you are showing people the real gsd (not just mean and biting dogs that some people think) and i think that is awesome and thank you for it. Hi Candy, thanks for your comments, we really appreciate your support on this! The point you made about the bullets flying is exactly one of the things I’m talking about. I don’t think it’s a matter of the Officers hating the dogs. I’d like to think it would take a pretty demented cop to choose K9 duty for the wrong reasons. Dogs in general are a lot of work, but Police K9’s require more extensive work and dedication to all that goes along with being a K9 handler than the general public can even imagine. A dog-hater would probably not want to deal with the heavy-duty requirements of a K9. There are any number of reasons more K9’s aren’t vested, none of which in our opinion is good enough. Wouldn’t it be nice if a law were passed that any department wishing to have or already has a K9 Unit would be required to properly vest the dogs? Would you send a human cop in a building where bullets are flying without a vest or helmet? Then why in the name of God would would you do it to one of His creatures that can’t even speak for themselves. They make vest for dogs, they make helmets for dogs. Hi Mike, thanks for dropping in and adding your comments. As always for any topic there are at least two sides. 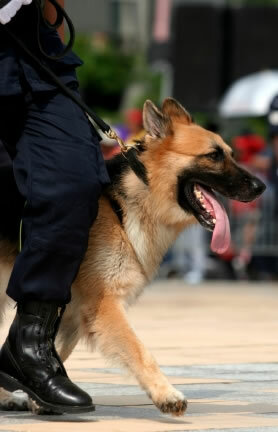 We totally understand that working dogs, especially Police K9’s need the ultimate in control. There are going to be those who believe that a collar is safe to use under any given circumstance. Our belief is that they are either misinformed or uninformed. If I understand you correctly, the Officers use harnesses when tracking. What about when the dogs are working but not tracking? I’ve seen them straining at the very end of their leash barking at the bad guy, leash taut, collar pushing hard against their throats. The problem with neck collars is the action of pushing on the throat. Using harnesses when tracking minimizes this hazard but doesn’t eliminate it. Police dogs are particularly in danger of being injured when wearing a neck collar because of the job requirements. There are dangers to dogs when using any type of neck collar (not just a choker) when the dog is pulling with a collar around their neck. You might want to try Googling for topics such as “dangers of prong collars” (and other collar types) and you’ll find the kind of information that I refer to. We have no doubt that K9’s are active, always want to work and are very high energy dogs. We understand that control is of the utmost importance and that K9’s are ALWAYS supervised. The fact remains that any dog that pulls when wearing a neck collar of any kind is in danger of injury to their throat. I tend to think because of what K9’s do for a living, the potential for injury is increased greatly. The trachea (part of the breathing process) is just one area that can be permanently damaged and even collapse. I’ve been advised by my vet and professional dog handlers as well about our own dogs pulling and the damage that can be done. A Police dog pulls when working (not just tracking). I doubt there’s a way to stop that from happening unless you release the dog from its collar or harness to do it’s job and that isn’t an option in many instances. We care about the dogs whether they’re K9’s or pets and feel strongly that there needs to be a better way to control a working dog or even just walk a pet dog that pulls, than a collar that can seriously hurt them. It just seems safer to harness them for work vs. collaring them for work and switching to a harness for tracking purposes. We still feel very strongly that all K9’s should be vested when working. No K9 should die because he wasn’t wearing a vest. Vests are not a perfect fit, the ones I’ve seen have quite a bit of open space around the shoulder area where a bullet can still hit it’s mark. But wearing one still provides more protection than not wearing one at all. Thanks for watching and we are happy you like the show. I just wanted to respond to the assertion that we have the dogs on a choker when tracking. I went back and watched previous episodes and all of the dogs that were tracking had harnesses on. I’d say that 99% of our handlers use harnesses when tracking. We use a harness to allow the dogs nose to reach the ground and not be held held off the ground by the choker. We also use chokers for control when the dogs are on patrol. When used properly the choker is a safe tool to control high energy dogs like ours. We have 21 K9’s and none have had a problem with the choker nor have I ever heard of previous issues.